With eclectic ideas and hard work, Pete Engelhart has managed literally to beat life into these wonderful sound sculptures. Although instruments such as the UFO might baffle some initially, imaginative players could bolster their sound palette with some very original percussion voices. Reasonably priced, innovative handcrafting, wide range of sounds. The sound might be a little too lively for some players. The handheld a-go-go bells are hand tuned. The Tiburon, aka the Shark! The UFO: Unidentified Funky Object. The cha cha bell has a lively ring that cuts through the music. The clave bell brings cutting, ringing overtones. The shade drums have hammered steel resonant top and bottom. Many drummers will have been made aware of Pete Engelhart's metal percussion following the introduction of the Ribbon Crasher and Remo Spoxe as used by Terry Bozzio. Rhythm Tech still produces Ribbon Crashers but with the further addition of six new superbly crafted instruments, the percussionist now has access to a complete family of traditional and innovative futuristic metal percussion. The clave bell is an interesting alternative to the ubiquitous synthetic wood blocks that are currently available, bringing cutting, ringing overtones over a fairly staccato sounding bell (the staccato sound is due to heavy damping inside the instrument). Available in two sizes, the clave bells can also be mounted together using a double clave bell bracket (available separately) creating melodic, low-volume a-go-go-esque patterns. We played these on a timbale set along with the cha cha bell, and the tones were wilder and more satisfying than we'd experienced before. When you play clave patterns on synthetic blocks, and then switch to the Engelhart clave bell you notice the difference in sound. We used the smaller size on gajate brackets so they can be played with a bass drum pedal equipped with a cowbell beater, and it cut nicely considering its size. The cha cha bell fell musically alongside the clave bell and helped give some life to many of the rhythms that we had played before. It has a lively ring that really cuts through the music and it is great for syncopated Afro-Cuban style patterns. The cha cha bell features a unique sidemount with the standard 3/8" diameter hole and chunky wingnut which means that you can play both ends as is traditional with hand-held cowbells. Some players might consider the cha cha bell a little too lively when compared to other mass-produced bells that give a dulled and muted tone, but that's why we loved them. Next up is the Tiburon, aka the Shark! If you turn this cowbell on one end with its 'fin' in the air, you'll see where it gets its nickname. If you hit it hard it can take your head off. Featuring a rounded metal handle welded directly to the end of the cowbell, it is surprisingly comfortable to hold. It could also be played when holding the bell by its mouth. You can get a nice selection of tones from the Tiburon and the tones vary when it is squeezed slightly, making for a very musical bell. There are two hand-held pitches available (A and G) along with mounted versions in A, Ab, E and F, each featuring a substantial wing nut. These could be grouped together on one post or peppered throughout the kit. Check this fella out! Looking like a character from a '70s instant mash advert, the UFO (that's Unidentified Funky Object) is hi-hat-like in construction, with a large lower metal flanged cymbal and a smaller bell shaped top cymbal. At only 5" in diameter it is easy to position on cymbal stands or 3/8" cowbell posts, allowing a wide range of dynamic possibilities when playing ride patterns or cascara styles. When played hard the cymbals create an eerie wah wah or flanger effect that cuts off almost instantly, and we were quickly able to adapt the usual hi-hat figures to create some interesting funk, Latin and drum'n'bass grooves. The UFO is a useful addition to your arsenal as you can play several sounds with one stick (similar to closed, half-open and open hi-hat sounds), and it bridges the gap between X-hats (which only produce one sound at a time) and a remote cable hi-hat (which needs two limbs to play it). You could position this unique instrument anywhere on a kit, and with the simple-but-sturdy mounting hardware, you could easily deploy multiple UFOs for interesting two-handed double ride possibilities. When you first strike the handheld a-go-go bells you will be pleasantly surprised by their beautiful tones and their sustain. The bells are hand tuned to achieve intervals of major or minor thirds, fourths or fifths so you can play very melodic patterns. The review model is a handheld pair, which have a flexible handle so you can squeeze the two bells together and produce a click as they strike each other. This could be useful for when you need a more staccato sound, achieved by squeezing the two bells together and then striking them. The mouths of the bells are painted red or blue in an attractive matt finish in contrast to the unfinished welded steel exterior. A mountable a-go-go is also available, easily mountable about the drum set or percussion rig via 3/8" cowbell posts. 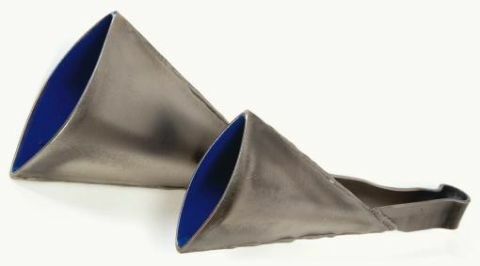 The interesting-looking metal shade drums come in a pair, and are more round than Engelhart's lens drums, which are of similar construction. They have a hammered steel resonant top and bottom, with welded sides and two tiny holes on the edge of each one to let the air escape when you hit it. There is a rounded sound bar that crosses their radius and is welded to each end. When struck it produces a sound somewhere between chimes and a steel drum. You can mount them anywhere around the drum set via a steel-welded mounting bracket made entirely from steel components. The whole thing sings with a shrill melodic interval when hit. Both drums are fully adjustable so you can mount them inline or side-by-side. This is an interesting range of affordable handcrafted instruments, that settle in to contemporary playing set-ups, and honour traditional construction methods. They challenge conceptual design boundaries and sound wonderful.